Jacob G. Padrón is the founder and artistic director of The Sol Project, and incoming artistic director at Long Wharf Theater. Kinan Valdez was the producing artistic director of El Teatro Campesino and is now a freelance director. Kinan Valdez: So we’re here. Jacob G. Padrón: We’re here. El Teatro Campesino. It feels really special to be able to have this conversation here, where it all began for me. When I found out I had gotten the artistic director position at Long Wharf Theatre, one of the first thing they asked for was a bio for the press announcement. I knew the first credit I would list was that my life in the theatre began with Teatro Campesino in San Jaun Bautista. It’s like coming back to the mothership. To be sitting inside the office of your dad, Luis Valdez, is also completely surreal. Kinan: I think it’s fitting, given that my father is a founder and visionary of both a theatre and a movement, and you’ve been carrying that torch forward over the last few years—ever since you founded the Sol Project in 2016. I led Teatro Campesino as producing artistic director from 2007 to 2017 before returning to the field as freelance director—but leading and founding are two different things. And you’ve done both. What’s it like for you to go from being a founder, with a clear artistic vision, to leading an organization that has a long and storied history? Jacob: I think the big questions American theatres are asking—not just Long Wharf—are: Are we really ready to acknowledge the injustices of our country? And how are we actually using theatre as a catalyst for change, and justice, and emancipation? I have tried to lead with those values in my work with The Sol Project. So to take that value system, which I learned here at El Teatro Campesino, and apply it to the work at Long Wharf—that’s going to be the journey. That also seems like it’s been so much of your life’s work, as producing artistic director at Teatro Campesino, and the work that you care about too. Kinan: The question of leadership here is always one of service to a very specific community, but it’s also to try to preserve the traditions of an organization and entity that fronts off as opening doors for others. I remember as a young artist coming up, I always felt my role would be as a bridge from one generation to the next. Even when I ran the company, I always felt that was an important role that had to be fulfilled. Somebody had to be the bridge in order to allow these traditions to be maintained beyond one or two lifespans. Jacob: Do you feel like the traditions continue to be passed on? Kinan: Absolutely. That’s something everyone in this company embraces. We’re having this conversation right now in Teatro Campesino: there are kids running around outside this office, and in the lobby you just saw people you worked with when you were a kid, who are now in leadership positions, and others—new younger members—who are essentially caretakers of the space and the traditions themselves, right? That’s been ongoing for fifty-some years. Jacob Padrón and Kinan Valdez in front of El Teatro Campesino. Jacob: When you took over the company, was there always a sense of, Okay, I’m going to do it for this amount of time? Did you have goals in terms of where you wanted the company to be at the end of your tenure? Kinan: I grew up as a direct beneficiary of the community-based work that Teatro Campesino did in San Juan Bautista, even though I had a front-row seat and was present on the road for all the professional successes of the company as a member of the Valdez family. What shaped me though—and a lot of my current collaborators—is the idea of community service. As young artists, my generation of Teatro Campesino saw all our mentors commit to giving back. We learned from them—and on our own—how to engage in that type of work in a meaningful fashion. When I came in as an artistic leader of the company, I wanted to make sure that not only would we preserve the community-based aspect of our local work, which had been always been a longstanding tradition, but we would work to expand the opportunities for other communities to experience the hands-on, participatory methods of cultural and creative empowerment—the Teatro Campesino way. So if anything defines my leadership it’s a return to community-based work as a guiding force. The motto that we embrace here, and have embraced over history, is “no experience required.” If you can walk, hold a sign, sing, or dance, this theatre company is for you. I think that’s an important reminder for the field at large: we have to have those entry points for people to discover that they’re storytellers, that they’re artists, that theatre is more about community itself. Jacob: The company was also the artistic home and a vehicle for your father’s projects, and in some ways the company was evolving alongside an artist who was building a body of work. Certainly with Zoot Suit and La Bamba, but also Valley of the Heart, recently produced at Center Theatre Group in LA. Is there a relationship with what the company is doing now and the way in which your dad is working now? Kinan: Teatro Campesino is a multigenerational company, and the ensemble ethos lives deep within its DNA. It’s not exactly a collective, nor is it exactly an ensemble. But those traditions run deep. 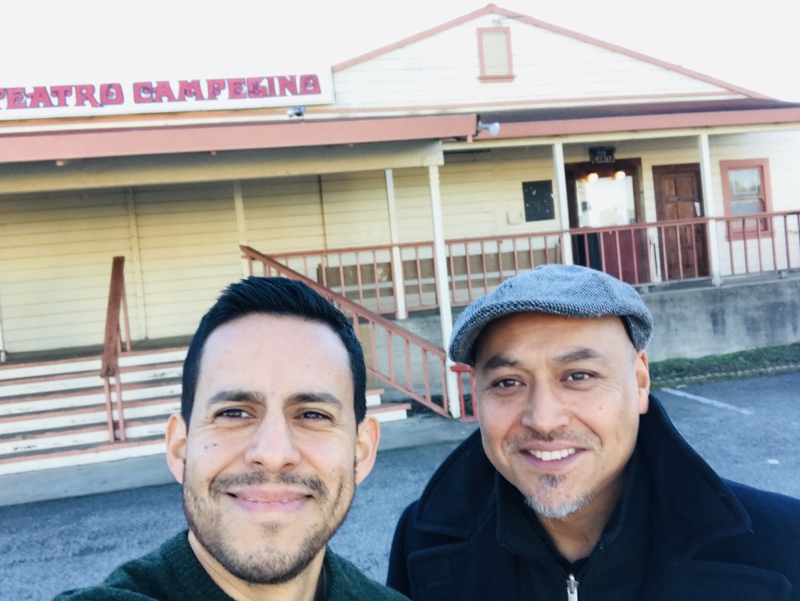 The community that has to be served is not just our local San Juan Bautista community, or the larger Latinx community, but also the company artists who are at different points along their own trajectory. How are you able to meaningfully engage with the desires and wants and dreams of those particular artists? Teatro Campesino can be a malleable thing that allows people to do different types of work depending on what their passions are. Currently we have a group of folks who are deeply invested in the idea of servicing this local community. We also have a group of artists, like my father, who are still heavily invested in working within the regional theatre, and this small facility here in San Juan Bautista still continues to serve as a launching pad to develop work, to take it to the major American stages. What shaped me though—and a lot of my current collaborators—is the idea of community service. As young artists, my generation of Teatro Campesino saw all our mentors commit to giving back. Jacob: I love the idea that we are all storytellers. You can joyfully find your voice here, and there is room for that voice. That’s also connected to the larger conversation with our American theatres: are we doing the work to widen the circle? That’s essentially why I started The Sol Project. I learned from Luis and Teatro Campesino to take our stories wherever I went, and when I arrived in New York I saw that our stories were not being reflected on many of our most visible stages. I had been inspired very much by the first Latinx Theatre Commons national convening we had at Emerson College, and I thought to myself, Can we create something to adjust what feels like a real systemic issue, in terms of our stories and our community not being reflected? Kinan: With The Sol Project, you were very specific and strategic about what your aims were. How did you develop that vision about needing to focus in on the Off-Broadway and regional theatres—as partners, as venues, as spaces, as arenas for this particular work? Jacob: It was through the specificity of knowing the population we wanted to serve that actually got us excited. And it was through the early support we received from you, Anne Garcia-Romero, Jamie Gahlon, and the Latinx Theatre Commons where our vision came into focus. The Sol Project is hoping to catalyze a growing movement that radically shifts the frequency with which Latinx playwrights are produced on our country’s leading stages. We do this work in partnership with companies that create some of our most visible platforms: the Off-Broadway companies and the large regional institutions outside of New York. That was part of the criticism, too—why we were going to create work at the predominately white institutions. There are the Latinx theatre companies that have been serving our community for years, and those are the companies that may need our resources and support. For me it was not an and/or, it was an and/and. Let’s continue to support those companies, let’s continue to amplify those voices, and let’s do a better job of celebrating their extraordinary work. Like El Teatro Campesino, those companies paved the way for so many of us. At the same time—to use the words of my dear friend Stephanie Ybarra—let’s also bust down the doors of the predominately white institutions! The American theatre is actually made richer when all of our voices can be in conversation with each other. When we launched the initiative, we also knew we did not want to self-produce. It was important that the work happen in partnership with theatre companies who had some skin in the game. Because part of what The Sol Project is also trying to do with our partners is transform culture by activating meaningful conversation about inclusion and cultural legacy. We aspire to really create artistic homes, not just for Latinx writers, but for all artists of color. Unfortunately, many companies believe they are actually doing better in terms of supporting artists of color than they’re really doing. I was recently a part of some grassroots organizing with Stephanie, David Roberts, and Roberta Pereira where we gathered data. We identified the ten largest Off-Broadway theatres in New York and we looked at the writers and directors they put on their mainstage over ten seasons—from 2007 to 2017—white artists versus artists of color. We then shared that information with each artistic director. Kinan: What was their response to the data? Jacob: Openness, sometimes defensiveness. We hoped by sharing the data it would activate conversation that could lead to systemic change. We then started to work with the People’s Institute for Survival and Beyond (PISAB). They lead Undoing Racism and Community Organizing workshops in communities around the country. Stephanie and Roberta took the workshop first, then I took it, then David took it. Then we were like, we have to organize, we have to enlist more gatekeepers! We partnered with PISAB and organized two workshops specifically for the theatre community in New York City. Not only did we invite the artistic directors from the companies we had gathered information on, but we also included agents, artists, managing directors, critics, and funders. The work of these cohorts continues. Kinan: There are a few of you, part of the cohort you mentioned, who are now going to be artistic directors. What’s it like to be a part of such a wave of new leaders coming in? Jacob: It’s exciting, but it’s also very overwhelming. I’m trying not to operate from a place of fear and scarcity, but to step into joy and to feel the abundance. It’s not lost on me how much is riding on these appointments, because I know that these kinds of opportunities are few and far between. I stand on the shoulders of giants, and yet the circle of artistic directors of color leading major theatres is still a very small number. Kinan: It’s fantastic you have such a support network to move in as a new class, so to speak. We always focus on individual journeys, individual leaders, but don’t recognize that all of us have a particular group of collaborators or friends that we talk to. It’s a great moment to enter this arena at this particular time. I believed wholeheartedly in the mission of the company, its vision, and how essential its work is, but the artist in me was clamoring once again to have an opportunity to do different types of work to continue growing. Jacob: I feel buoyed by the community and supported as I think about the trailblazers like yourself, like Eric Ting at California Shakespeare Theater, Joe Haj at the Guthrie Theater, and Marcela Lorca at Ten Thousand Things Theater. I imagine the journey’s probably been very lonely, because while there’s this crop rising together, there are folks like yourself who were running these companies when maybe there weren’t as many peers that you could turn to. And, as we know, leadership is very lonely and very difficult. Did you feel that during your time of running Teatro Campesino? Kinan: Yeah. But I also think one of the great trends that’s been shifting is the old model of directors assuming leadership positions within a company. Given the fact that directors by nature have to delve into the work itself, I wonder if we somehow created that sense that it’s on our shoulders, we have to do it alone. I think you represent this new force of producers who are dealing with resource issues and are trying to move beyond the scarcity model, towards a place of abundance. The lens by which we see things is totally different. As a director, I had no idea that producing would be such a large amount of work I would have to do as a leader. I was ill-equipped when I assumed the role. The artistic side was fine, but in terms of being able to manage resources and people and be a generator of circumstances was difficult for me to wrap my head around. I know that you’re a professor of producing as well at Yale School of Drama now. I’m curious how that works, just the idea of new leadership being producers as opposed to directors. Jacob: I imagine there are some who might scoff at that a little bit, because the path has traditionally been that if you wanted to run a company, you were a freelance director first. I wonder if things have shifted because our organizations have evolved so much over the last several years, and my sense is that institutional leadership has become more important for these artistic positions. In that way, I actually feel very prepared. I went to the Oregon Shakespeare Festival as an Associate Producer after graduate school, then to Steppenwolf, and then to the Public Theater. I also did my graduate fellowship at Center Theatre Group, so I feel like the institutional piece really prepared me to be able to lead a company. That being said, there may be deficiencies I encounter because I did not train formally as a stage director. There may be things that I have to learn. The good news is, leadership is about lifelong learning. I think only time will tell, but I really appreciate that the American theatre is evolving so that there isn’t just one path to becoming an artistic director. Kinan: I come from a different generation, even though we’re not that far apart in age. And yet our mentors were different. Jacob: Who were your mentors? Other than your dad. Kinan: I had a lot of mentors within El Teatro Campesino, such as Rosa-Maria Escalante, who, along with my father, guided me towards directing. But, field-wide, Diane Rodriguez was a major influence, a major force. She actually was a member of El Teatro Campesino during its most widely known era, and made the leap into the regional theatre. She set a powerful example of leadership. Artistically, another one was Sam Woodhouse from the San Diego Rep. As a young artist, I learned a lot about how to navigate the regional theatre from our shared experiences at the San Diego Rep.
Jacob: You’ve also moved into your own. You’re a generative artist. You are writing, yes? And certainly directing. Can you talk a little bit about that—now that you’re no longer running the company, for almost two years, what’s percolating for you? Kinan: Towards the end of my tenure as El Teatro Campesino’s producing artistic director around 2015, I began to realize my own artistic impulses weren’t always in alignment with what it means to be El Teatro Campesino. Don’t get me wrong, I believed wholeheartedly in the mission of the company, its vision, and how essential its work is, but the artist in me was clamoring once again to have an opportunity to do different types of work to continue growing. I also began to feel unfulfilled with running the management side of the organization as well as the artistic. That was critical and essential work too, but it had become my full focus—much to the detriment of my creativity. So I made the choice to leave the leadership position in order to find my artistic voice again. I chose to do that as a both freelance director, as I had been at the beginning of my career twenty-some years ago, and—after a short hiatus—as a regular ensemble member of Teatro Campesino. At the start of 2016, I announced I was going to be transitioning away from my role as artistic leader in 2017, that I would go to a dark period with the theatre for a year and then return as a collaborative artist working under its banner sometime in 2018. Two years into my break from the company, and I realize I’m still passionate about El Teatro Campesino. I always will be. It’s home. It’s family. Jacob: Can you talk a little bit about the idea of how you felt like your own artistic impulses may or may not be aligned with those of Teatro Campesino? Kinan: As artists, as human beings, we have to continue growing, right? Our life experiences can also dictate the type of work we’re going to do at a given time. It’s important to preserve, in my case at least with Teatro Campesino, the essential work of creating theatre dedicated specifically to social change. That said, the artist in me is not always interested in looking at artistic work from that angle. Sometimes there are different types of stories I would like to tell, different approaches to material, maybe slightly more experimental in nature. I couldn’t necessarily pursue that as the producing artistic director of Teatro Campesino. I was not entrusted with the resources of the company to just pursue my individual artistic vision, but to preserve the work and the approaches and methodology that had been essentially a collective creation over a fifty-year trajectory. Part of the interesting thing about Teatro Campesino is that even now it’s a shared leadership model. Jacob: Was it shared even when you were in your position? Were you empowered to make decisions? Kinan: I was reared in the ensemble tradition, so I was empowered to make those decisions. I tried to create a space that was open to others. But that said, there are multiple generations that you are responsible for. I’ve searched for the type of metaphor or model that best fits, and what I’ve settled on is the idea that it’s like a department chair in a university. For years I served as the department chair, but knew I had to eventually pass that chair on to somebody else in order to pursue my own research. For ensemble companies or companies that work in that collaborative method, how do you pass on your traditions when they were not set by one person? That’s one of the things the company is trying to navigate right now, even under the shared leadership model. Jacob: And, with this model, there’s a next-generation group of leaders charged with thinking about how to continue to preserve El Teatro Campesino’s legacy? Kinan: It’s not a question of necessarily recreating constantly the actos from the origins, but to actually make the methodology available to future generations. That said, a group endeavor is not always an easy one. With the Sol Project, you are definitely the artistic leader and yet you’ve organized it as a collective. I’m curious about what your new leadership transition means for the collective you’ve started. Jacob: The six artists that make up the founding artistic collective of The Sol Project have been so instrumental to the work of the initiative. And we just added two new members to the collective. We also have our residents (Brian Herrera and Stephanie Ybarra). We recently announced that one of our founding members, David Mendizábal, will be the new associate artistic director. David has been my deputy from the beginning and he’ll be able to step into more of a leadership role as I have my hands full at Long Wharf. I will continue to serve as the artistic director but I think this is an exciting time of growth as the work of the initiative expands and strengthens. My hope is we’ll make space for each member of the collective to feel more and more ownership of the work, while continuing to fortify the mission of Sol. The way I have led The Sol Project is the way I talked about how I planned to lead Long Wharf during the interview process with the search committee. I think that more of a servant leadership model is the way of the future—where the entire staff feels like they, too, have a stake in the vision and path of the theatre. I’m interested in continuing to think about what it means to be an artistic leader inside a large company where the staff all feel connected. How can we work together to activate their imaginations? How can we tap into their artistry and unique gifts? How can we empower each other to feel heard and be seen? The more we all feel deeply connected to the work on stage, the more vibrant we’ll be as a company. It’s about modeling a leadership of meaningful connection. Jacob: Something I’ve also been reflecting on is how much of our success really does rest with the people we report to—the board of directors. As new leaders, we are often charged with transforming the companies we inherit, which is exciting but daunting too. We need the support of our boards from the beginning, especially when things get difficult. We must make the path together, as our future success is linked to each other. Our boards also need new language for how they talk about the work of the theatre. During the search process I used words like shared leadership, social justice, and dismantling structural racism. Our theatres must be a gathering place for joy and liberation through the world-class theatre we produce. I think that’s a pretty radical shift. That is the work of El Teatro Campesino, and to see that work now move into our large regional institutions… That is the way of the future.